Typically, when people first decide to become a nurse they think of taking patients’ vitals in a clinic or conducting assessments in a hospital. 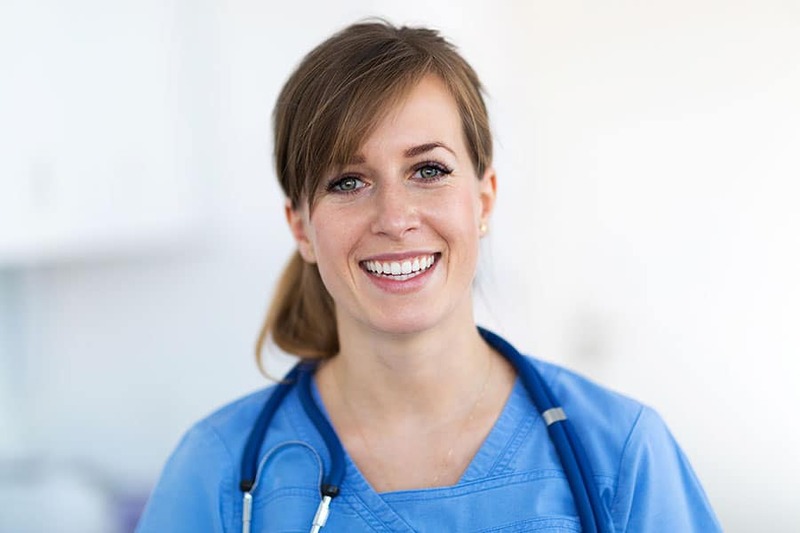 As you go through nursing school, however, you start to realize the wide range of nursing specialties that are available and the perks that come along with them. From pediatric care to midwifery, there are many specialized options, each with unique benefits, that appeal to a wide variety of students—but which nursing specialty pays the most? While a high-paying specialty is an obvious perk, it is important to consider what your interests and goals are when deciding which position you want to pursue. With that in mind, here are some of the most financially rewarding careers for nurses. A registered nurse anesthetist consistently ranks at the top of high-paying careers for nurses, making a median annual salary of $176,546 according to Salary.com (1). That is because Nurse Anesthetists are advanced and highly skilled registered nurses who work closely with medical staff during medical procedures that require anesthesia. Also, due to the complexities of this type of clinical care, anesthetists are prone to more lawsuits and therefore must be completely comfortable in this field. Nurse midwives are second on the list with a median salary of $104,590 (2). Typically seen as a career exclusive to women, more male nurses are unsurprisingly exploring careers in midwifery (3). Certified nurse midwives are able to enjoy a special relationship with their patients that evolve in a critical time in their patients’ lives. Midwives care for their patients through the joys and challenges of pregnancy, labor, and birth. This is no easy task, and is definitely deserving of this #2 spot! Nurse practitioners are able to make long-lasting connections with their patients by providing basic preventative health care. They most commonly work in family practices, however, they can also use their profession in adult practices, women’s health, pediatrics, and a number of other healthcare facilities, making this career incredibly versatile which can be seen as a benefit in itself. Nurses in this career can expect an annual salary of $100,910 (4). Nurse researchers scale the top of the list with an average salary of $95,000 (5). This position includes scientists who study various aspects of health, illness and healthcare. By researching and implementing scientific studies, nurse researchers help to improve health care services and health care outcomes for patients, making this nursing specialty absolutely essential. Psychiatric nurse practitioners earn an average of $95,000 a year in this specialty (6). In this field, nurses treat patients with a range of psychiatric and mental health disorders, often at a mental health facility or correctional center. They provide vital and often life-changing care to their patients by offering daily physiological, mental, emotional, and even spiritual support. By providing medical treatment along with counseling to comfort patients, this career is not only rewarding financially, but emotionally as well. Orthopedic nurses specialize in working with a wide range of patients who struggle with mobility issues due to disease, disorder, or injury. The type of care they administer to their patients include assisting with surgery, physical therapy and rehabilitation, and creating a wellness plan. Orthopedic nurses generally work in hospitals, emergency rooms and outpatient clinics, and earn an average annual salary of $81,000 (6). If you have a strong desire to aid to the elderly, this specialty might be for you. Gerontological Nurse Practitioners (GNPs) hold advanced degrees specializing in geriatrics and are trained to be able to treat their patients’ long-term and debilitating conditions. Similar to all nurses, GNPs must approach nursing holistically by paying special attention to maintaining a comforting bedside manner for their elderly patients. Nurses in this specialty can expect to make an annual wage of $75,000 a year (3). Pediatric nurses have a rewarding profession by treating children and earning an average annual salary of $67,000 (3). Pediatric nurses are able to find employment at a variety of facilities, including urgent cares, ICUs and even at schools. It is important that those in this career are comfortable communicating to their young patients as well as their caregivers. Also known as intensive care unit (ICU) nurses, clinical nurses must be able to act quickly under pressure and should possess excellent decision-making skills. Clinical nurse specialists provide patients with care by diagnosing and treating disease, illness, and injuries. The average salary for a clinical nurse specialist starts at $64,483 (7). Neonatal nurses have a highly demanded and highly rewarding specialty in caring for newborn babies up to 28 days old. Nurses in this specialty are able to care for sick and/or premature newborn babies by administering oxygen, medication, and some more basic procedures in an NICU. Neonatal nurses average salary range starts at $74,000 (8). There are tons of financially and emotionally rewarding careers in nursing. Whether you’re treating newborn infants, treating the elderly, or anywhere in between, there are specialized nursing careers that require unique skills and offer a wide range of benefits to appeal to every aspiring nurse. If you’re ready to get your nursing career started, contact us at Eagle Gate College. Our friendly and knowledgeable staff will help you pick a program that will help you enter a financially and emotionally rewarding career in nursing. https://www.eaglegatecollege.edu/wp-content/uploads/2018/04/nurse-4-30.jpg 600 900 EagleGate https://www.eaglegatecollege.edu/wp-content/uploads/2019/02/EG_Logo_ColorHorizontal-1.svg EagleGate2018-04-30 08:00:052018-04-30 08:00:05Top 10 Highest Paying Nursing Categories.